I'm Carolina ..: What’s The Best Time To Workout ? 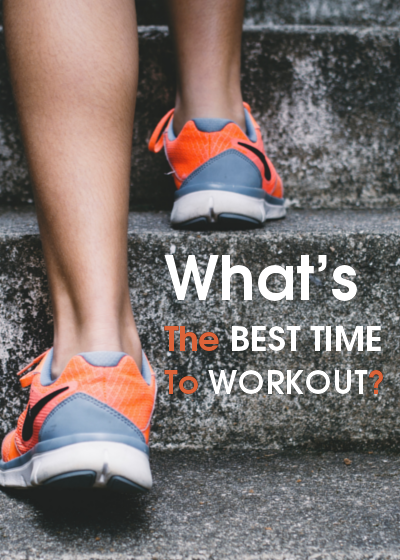 All of us wonder what is the best time to workout ? The answer is any time ! It is really important to know that it is not about time, what really matters is you performance and involving your body in a deep recovery mode. Mark Twain once said: “Eat a live frog first in the morning and nothing worse will happen to you the rest of the day”. That means the very first thing you do, must be the most challenging task of the day. Thus, “your frog” is the greatest positive impact on your day and personal goals. Exercising early in the morning offers numerous benefits, not only for your health but also for the rest of your day. First, morning workouts will push you to be a morning person, so you’ll be adopted to a sort of discipline. As far as health concern, it will also speed up your metabolism, improve your lung functioning and regulates your appetite; you are more likely to eat healthy food. Working on fasted statue (insulin and glucose are low) will put your body in a fat burning environment. That means your body is going to burn fat from every single part and use it as fuel. As a result, it will be easier for you to lose your unwanted extra pounds and look more lean. It is scientifically proven that human will power and determination are peaked when we first wake up and gradually go off. When you start you day with sports, you will be energized and packed with feelings of pleasure, enthusiasm and high self-esteem. Such workouts will also increase your blood flow through your brain, this mental effect will be shown obviously through out the whole day and you will experience a sense of comfort and your capacity to handle daily stress is triple. This will also work as a “reset button”, clears your mind, help you have positive decisions, protect your memory and alert you to be more focused on your next task like working or studying. Besides, when you make your workouts as the first daily task, it means that you specify some time to yourself only. Also, after a long day work, you won’t face the problem of having difficulties to go to gym, so you have no excuses to not to. - There is no specific time but expert’s advise is to start working out at 6:35 am. - As soon as your alarm goes on, start moving immediately instead of checking your e-mail or social media networks. - Drink a large glass of water to keep yourself hydrated, rebalance your inner body and also to stay awake. - You are required to workout from 30 to 60 minutes. So you have to set your alarm properly to avoid being late and thus stressed. - Start up with something that energize you and not pushing you to go back to sleep like YOGA ! It is better to start with warming yourself up, do stretch exercises and then go for a run. In the morning, many people feel tired, dizzy and just want to enjoy morning coffee calmly, while others prefer to workout in the evening or in the afternoon because this is when their schedule allows. So, time does not really matter as long as you exercise regularly. Don’t skip lessons or leave your office to workout, train when your schedule allows. Actually, working out in the evening or afternoon has several surprising benefits. So, after you have rest after your work day, it better to start your workout session rather than watching T.V. These workouts will help you build your energy reserves after a long day of office. This is also known as a “recovery phase” in the second half of the day and satisfies your energy demands. In the end of the day, workouts will give you energy while you may feel tired and force yourself to exercise in the morning. Also, this will help you to get rid of the whole day distraction, set your mood and sleep better. However, you should pay attention of what to eat during this delicate time. Pre-Workout Snack: You have to eat at least 1 hour before you workout. You can eat fruits, oatmeal, whole wheat toast bread with peanut butter and banana, dried fruit and Greek yogurt. Eggs are also helpful, they keep you from over eating and are easy to digest. Those snacks will help you improve your workout endurance and performance and maximize your energy. Post-Workout Snack: After working out, you must eat within an hour to reduce fatigue, refuel your body and optimize muscle recovery. Your snack should be balanced ;protein, fats and fiber. You can eat veggies, chicken breast, veggie omelette, fish or one cup of chocolate milk.